Having won the Free Captains' Regatta, the adventurers must now claim their prize - the uninhabited Island of Empty Eyes. Yet exploring strange ruins and fighting the isle's monstrous denizens won't be enough. 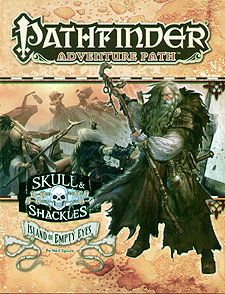 Once they've got things well in hand, the adventurers must host a feast for the Shackles' infamous Pirate Council, only to have a dangerous situation turn even worse when a mysterious saboteur threatens to disrupt the party. Can the adventurers tame their island and protect their influential guests? Or will they lose the respect of the pirate lords and fade into obscurity? "Island of Empty Eyes," a Pathfinder RPG adventure for 9th-level characters, by Neil Spicer. Pirate legends and mysteries of the Shackles, by Jack Graham. Details on the cyclopes who once ruled the Shackles, by Gareth Hanrahan. Island harpies in the Pathfinder's Journal, by Robin D. Laws. Five new monsters, by Alex Greenshields, Michael Kenway, Mark Moreland, and Tork Shaw.